Well, it's been a long time coming! When we first built the house nine years ago the downstairs toilet had a 'temporary' vanity. 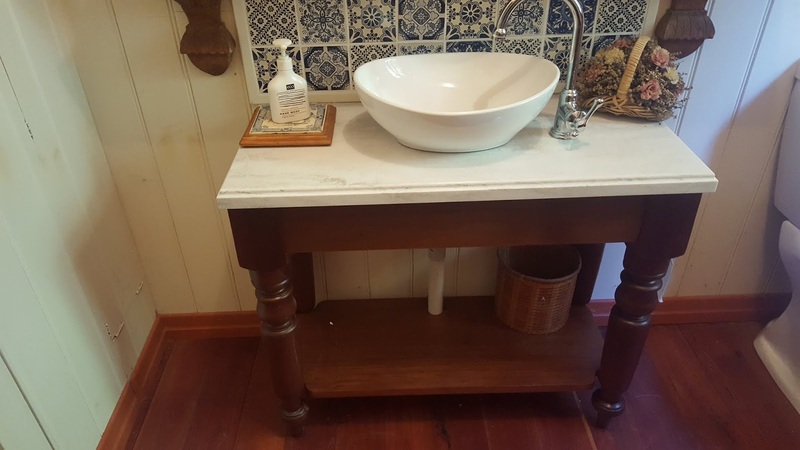 It was made from a sheet of laminex-coated ply, four pine posts (from the original set-out posts for the house) and a second hand sink. Not a pretty thing, and after several years it had started to sag in the middle. A few years back we bought four cedar table legs on ebay. The tops were in bad condition, so Russell removed them and made new tops from old cedar window frames. The legs then just needed a quick run through a lathe (via a friend's Men's Shed connection). Rails and shelf were made from the remains of the wardrobe rebuild done earlier in the year. 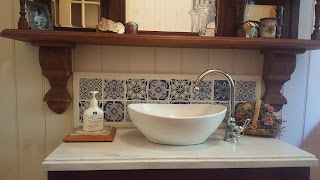 As we have another old marble-topped washstand in the room, we bought a Corian top in 'raincloud', which has similar colours to the old marble. The Corian is not cheap, and we had to limit the width to 930mm as this is the standard width the Corian comes in - any wider and it would have almost doubled the price.